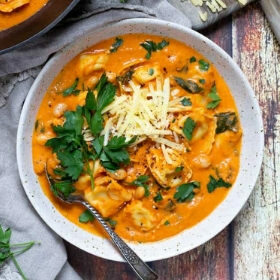 The ultimate comfort food, this tomato tortellini soup is loaded with San Marzano tomatoes, cheesy tortellini, white beans and spinach! Heat olive oil in a large pot over medium high heat. Add onion along with a pinch of salt and pepper. Saute, stirring frequently for 3-4 minutes. Add garlic, sage, thyme and oregano and saute for another minute. Add tomatoes, vegetable broth and pinch of salt and pepper to the pot. Simmer over medium heat for 2-3 minutes. Transfer to a blender and blend on high for 2 minutes or until smooth and creamy. When adding hot liquids to a blender, always make sure the steam has somewhere to escape. I like to leave the pour flap open and cover it lightly with a dish towel. This allows the steam to escape, but the kitchen towel catches any flying soup. Return soup to the pot and stir in white beans and tortellini. Cover and simmer over medium low heat for 8-10 minutes or until the pasta is al dente. Remove from heat and stir in the heavy cream and spinach. The spinach will quickly wilt into the warm soup. Garnish with parsley and shredded cheese and enjoy! Taste the pasta during the cooking process. There is nothing worse than overcooked pasta, so make sure you take a bite here and there throughout the process so that you can pull it off the heat as soon as it is al dente. Al dente means that your pasta should still have a bit of a bite to it. Ask any Italian (or any pasta lover, really) and they will tell you that al dente is the only way to cook your pasta. Most pasta directions will include cook times for firmer (or al dente) or more tender pasta. Always err on the side of al dente. Read your tortellini cooking instructions. Some tortellini cooks in 3 minutes, others take 7-8 minutes. Read the directions on your package and take them into account during the making of this soup. I use Buitoni refrigerated tortellini for this recipe so that is what my cook time and instructions are based on. If you prefer a super creamy soup, double the amount of cream! A little extra cream can go a long way to making an ultra smooth soup and this recipe lends itself well to a double serving of heavy cream!